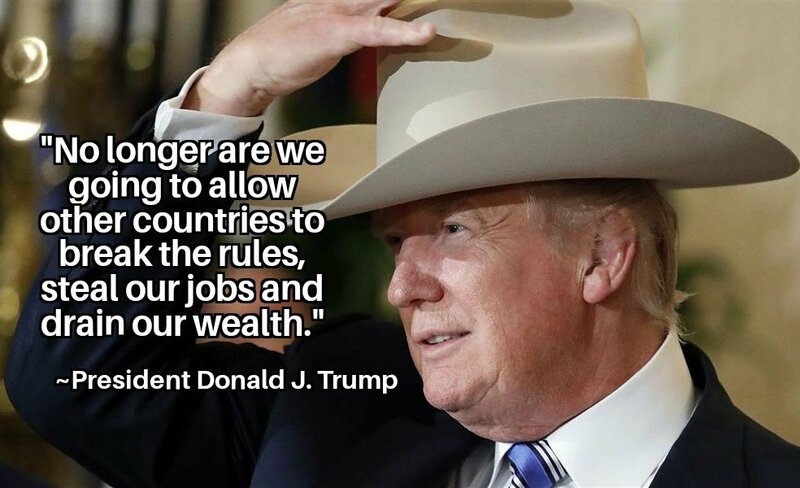 President Trump wearin' that Cowboy Hat! "Trump 2020" Trump for President Re-Election Website President Donald J. Trump's "Trump 2020" re-election campaign website. New slogan for "Trump 2020" is Keep America Great! Blue-Collar Builder Businessman President Trump. Donald J. Trump You Tube Channel Donald J. Trump You Tube Channel Website. Donald Trump's Facebook Donald Trump's Facebook social media. Full Speech - President Trump Returns to State of Ohio for Rally July 25 2017 President Trump's Full Speech at a rally in Youngstown, Ohio July 25 2017. July 2017 Professor Blue Collar Michigan Scholar's "Trumps First Six Months" of America First accomplishments, President Trump's remarks at U.S.S. Gerald R. Ford Commissioning Ceremony and other great links. Statement by President Trump Statement by President Trump on Charlottesville, Virginia. The White House Featured Videos President Trump's featured videos website. Trump White House pics photos on Official White House Flickr account. President Trump's Remarks to Federal, State, and Local Law Enforcement July 28 2017 President Trump's remarks to Federal, State & Local law enforcement on the Trump administration's gang violence initiatives and other topics. C-Span video. President Trump Honors Congressional Baseball Shooting First Responders with Medals of Valor Ceremony at The White House Trump awards The Medals of Valor to the First Responders at a White House ceremony. C-Span video. President Trump Delivers Remarks at 2017 National Scout Jamboree Trump gives remarks at 2017 National Scouts Jamboree. President Trump Delivers Remarks at The U.S.S. Gerald R. Ford Commissioning Ceremony Michigan's Gerald R. Ford served the United States of America with great honor and distinction as Vice-President (1973-1974) and President (1974-1977). America First: President of The United States of America Donald J. Trump's First Six Months - January 20 to July 20, 2017 First 6 months - January 20th 2017 45th President Inauguration to July 20th 2017. America First Accomplishments. The White House Blog The White House blog is a great way to stay informed with the latest and greatest news and events. The White House Briefing Room Page: "Press Breifings" White House Breifing Room Page - Press Briefings, Gaggles...etc. with newspapers, magazines , radio personalities, bloggers, various media outlets. Text of press briefings is presented. Skype is utilized occassionally for media that can not be present at the press briefings. Great forward thinking on President Trump's part.